The Priory Water Sports Centre is shared by Priory Sailing Club and Bedfordshire Canoeists Association. There is a grassy foreshore, parking space for dinghies, a beach, slipway, bank and a jetty which provide excellent launching for all craft. The clubhouse has changing rooms, showers and a self-catering kitchen upstairs and a disabled toilet and shower facility on the ground floor. There is a “Wet Training Room” also on the ground floor which is used for briefings, a muster point for groups and is convenient for those members who are wet from sailing and need to get out of a cold winter wind for a few moments before going out on the water again. Dogs are permitted in the grounds as long as they are on leads and under control. The lake is open seven days a week during the months of April to October and at weekends from November to March, when part of the lake is closed to protect the wildlife. The lake is also used by School and College groups in the week. For those people who have their own sailing dinghy, windsurfer, canoe, kayak,or Standup Paddle Board then day / half day or Wednesday evening visitor tickets are available for the use of the lake and water sports centre at a very modest fee. Please see the membership page for current charges and further information. Please note that Priory Sailing Club cannot provide sailing or canoeing equipment for day visitors. 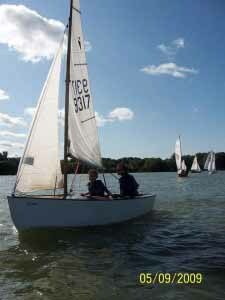 Priory Sailing Club is a Royal Yachting Association (RYA) Recognised Teaching Centre for Sailing & Windsurfing. 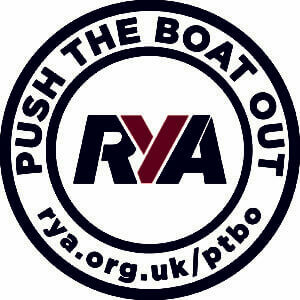 Priory Sailing Club also offers RYA OnBoard and RYA Champion Club opportunities for young people. An outstanding feature of the club is the opportunity of free training for club members. It really is a fantastic place to learn and develop your sailing. Our partner organisation Bedfordshire Canoeists Association offer British Canoe Union Kayaking, Open Canoeing & Stand Up Paddle Boarding (SUP). Priory Sailing Club Rules insist that a buoyancy aid must be worn when undertaking dinghy sailing or when using the safety craft. Windsurfers that are using a harnesses may make their own decision as to whether to wear a buoyancy aid or not. At weekends and on Wednesday evenings there is normally a safety boat available. An active programme of social events is organised throughout the year including various barbeques, fun events, quiz nights, new members lunches and the Club Regatta, which is run in aid of the RNLI. We publish a Club newsletter called “Telltales” and publish news items and a diary of events on this web site. More details on what we can offer are available on the Members About Us page. The lake is a 68 acre former gravel pit now landscaped with shrubs and trees and an island and is situated in Priory Country Park just to the east of the centre of Bedford. The Country Park also contains a visitor centre, marina, hotel and adjoining Beefeater restaurant, walking, national cycle route and fishing. More details on what is available within 360 acre site can be found on the country park website. At weekends, there is always someone on duty at Priory Sailing Club and you will always be guaranteed a warm welcome, so please feel free to visit us to see the Club, meet members and explore what we have to offer! Alternatively, drop us an email using the contact page.